Images and tattoo artwork involved in the images above are property of Bluenote Tattoo located in Las Vegas, NV. 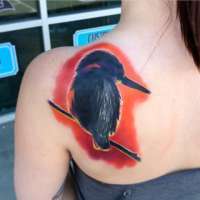 Bluenote Tattoo, a tattoo studio located in Las Vegas, NV. The studio's staff includes tattoo artists such as Krystof and Josh. The studio has a 5/5 combined rating from 110 reviews. This rating is a combined value of the studio's Facebook Page and Google Places Page. Images are property of Bluenote Tattoo located in Las Vegas, NV. This studios listing information was last updated 6 months ago. Eric's amazing. He has a super light hand, he's meticulous, his work always heals up super fast, and it lasts. Josh is A, #1, in my book. His color tatoo's are awesome!! !